I think how producers come to option books for adaptation is really intriguing. Think of the enormous volume of books out there, both novels and non-fiction; let alone original scripts; how do you possibly choose material? The directors of the upcoming Cloud Atlas, the Wachowski siblings, discovered David Mitchell's book via Natalie Portman, who was reading Cloud Atlas on the set of their 2006 "V for Vendetta." The siblings then recommended the novel to Thomas Tykwer, and the three collaborators spent years and years bringing this sprawling saga to the screen. Funny that Natalie Portman is not even in the movie! Ironic when you consider how many characters there are - at least in the book. The $100 million project condenses that whole slew of characters into just six stories that span about 500 years. Lana Wachowski (formerly Larry) told the Huffington Post "The book seemed almost like a revolutionary act in and of itself. David has said since that they did have trouble with, do you put it in science fiction, do you put it in drama? Where do you put it on the shelf in the bookstore?" I'm in the middle of the book and while the concept is fascinating, some of the reading is sheer agony. In addition to creating some absolutely brilliant new words and spellings, Mitchell LOVES writing in dialects and accents. Right now I'm reading Zachry's story which is full of dropped d's and unusual grammatical constructions. "I was pleased our dammit crookit guest'd teached ev'ryun to step slywise an' not trust her, nay, not a flea, but I din't sleep none that night, 'cos o' the mozzies an' nightbirds an' toads ringin' an' a myst'rous someun what was hushly clatt'rin' thru our dwellin' pickin' up stuff here an' puttin' it down there an' the name o' this myst'rous someun was Change." I'm exhausted from just typing all those apostrophes! I prefer that kind of thing when it's done subtly as opposed to being every word out of the character's mouths. I get it because ZACHRY is part of the post-apocalyptic future where presumably if you have to start civilization from quasi-scratch, your language may be both basic and creative. Regardless, it is tough to read. In the movie the actors are playing multiple parts as well as characters in different time periods, even occasionally changing race and gender, as each individual "moves upward, downward or sideways on the karmic plane." On IMDB.com, Tom Hanks is listed as playing six parts: first as Dr. Henry Goose sailing the South Pacific in 1849, a Hotel Manager in the 1930's, Isaac Sachs, a nuclear scientist in California in the 1970's , an angry thuggish writer who throws a critic off a London balcony, a Look-a-Like Actor and Zachry in the post-apocalyptic 24th century. the 1930's, Luisa Rey - a journalist in the 1970's, and Meronym - part of the elite ruling class of Zachry's post-apocalyptic world. She even plays Asian male medical expert at one point. Having seen Halle Berry's body in a fair amount of films, I can only say this I gotta see! I actually am interested to see what she does with these characters, especially Luisa Rey and Meronym as written in the novel. I don't even know what to say about Tom Hanks. He looks so odd in these pictures. But maybe I'm just being a Tom Hanks hater due to a couple of, IMHO, bad casting choices ala DaVinci Code, Extremely Close and Incredibly Loud. I can say for certain I'm not looking forward to hearing Hanks spouting Zachary' gobbledegook. In this case, it's not Hanks who's to blame, it's Zachry's dialogue as written in the book, which I imagine will be in the movie. Unless of course I'm totally wrong and Hanks brings Zachry to life which is completely possible when you think about the bulk of Hanks career. An actor, who when properly cast can bring it whether he's a rom-com hero in Sleepless in Seattle and You've Got Mail or the man in more serious straits as he was in Philadelphia or Saving Private Ryan. ... Or, or, or they changed it in the movie. Which is also possible when you consider this. Mitchell, the book's author, who also helped script the adaptation said "The book is unfilmable, but they haven't quite adapted the book. They sort of disassembled the book and reassembled it in the form of a filmable film by having actors recurring, and implying, therefore, it's the same soul on this sort of ethical journey – or, no pun intended, a matrix of ethical journeys." So who knows how much the book and film will compare - beyond the saga spanning time. It's challenging material that I'm finding (yikes, still not finished) sometimes riveting as in Sonmi's transformative tale and sometimes just tedious and sometimes just too murky (for me anyway) to wade through. I'm hoping it will be a little less cloudy when I finish - if I finish. 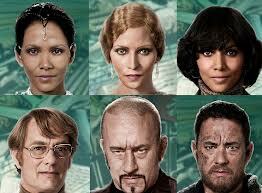 I do think the movie looks promising even if Tom Hanks does look like he's wearing a bunch of bad wigs. It's definitely a very ambitious effort. Practically speaking, the difficulties of shooting a multi-location, multi-period period piece with a core group of actors playing multiple parts, but also as far as the storyline goes which may be a tad too out there for some. Tom Hanks vigorously defends the film in an LA Times article "There are going to be people out there who are going to say, `Who do they think they are to make this movie like this?' That's been the case with every great film. They said the same thing about `The Cabinet of Dr. Caligari' in the silent days," Hanks said. "I think every audience is yearning to be surprised. I am bored when I walk into the theater expecting A, B, and C, and a movie delivers A, B, and C. I want to see something brand new that I never anticipated coming a hundred million miles away. 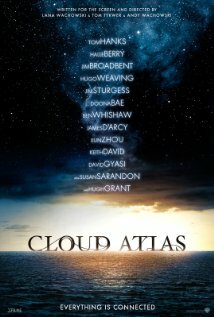 And my God, that happens before the words `Cloud Atlas' appear up on the screen on this one." I know that this write up is not exactly encouraging but maybe this particular book is just not my cup of tea. Sometimes I'm too stubborn to know when to quit!